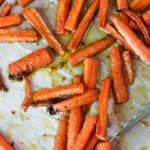 Oven roasted carrots are delicious and super quick and easy to make. An amazing side dish the whole family will love, maximum flavor with minimal effort! 1 teaspoon fresh thyme leaves optional. Slice carrots about 1/2 inch thick and 3-4 inches long. Place on lined baking sheet (see note). Pour olive oil, spices, and brown sugar over the carrots. Toss to coat evenly and spread carrots into a single layer. Bake on the middle rack in a preheated oven for about 25 minutes, tossing halfway, or until the carrots are tender and slightly browned. Sprinkle with fresh thyme leaves. Adding the brown sugar is optional, it aids in the caramelization process. Lining a baking sheet is also optional but it speeds up clean-up time. You can use foil or parchment.